FT-IR measures properties of organic materials (mainly, sheets and films) at a spot where laser light is applied. Materials used in the production line, such as felt pen, tape and bag, are measured and added to the library, enabling wide range of analysis. 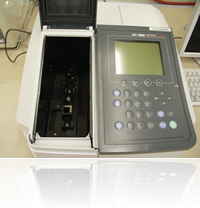 The UV-visible absorbance measuring method measures a rate of absorption of light from 200 to 800 nanometers. 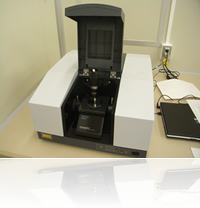 It identifies material, examines purity of material, and performs quantitative analysis. 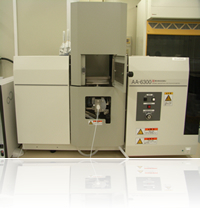 The atomic absorption method utilizes phenomenon that atom absorbs light of specific wavelength. It uses a hollow cathode lamp as a light source that emits light of wavelength specific to an atom. By measuring amount of absorbed light, a density of atom is found.